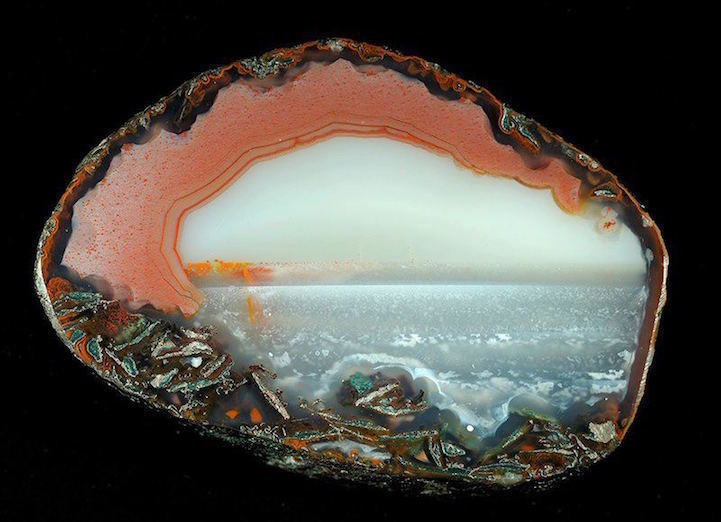 Home » These Surreal Gemstones Look Like They Have An Entire World Hidden Inside Them. Your eyes are not playing tricks on you. These are some of the most beautiful and intricate works of art that can be found on agate stones. The semi-precious gemstones have not been altered by human hands and tools but are a natural formation. Agates are typically formed from volcanic rock and lava; no two pieces are the same. One variation of the stones has been named “landscape agates,” for its patterns resembling oceans, red desert mountains, and trees in a swamp. Regardless of size, each rock is cut and polished, revealing nature’s own artistry. Agates today are used for jewelry but in ancient times they were used to make mortars, pestles, and tools for hard-stone carving. This is another reason why nature is perfect and as it turns out, the greatest artist of all. Next, some of the most surreal gemstones on earth.